Two well crafted letters with excellent points appear in today’s Sunday New York Times in the City section where the article “The Battle of Washington Square” appeared last week. The letters are accompanied by a large picture (at last!) of the fenced-off Arch and Park under construction. * The points emphasized by the letter writers – the letters are posted below – are unfortunately missing from the Times’ article. Inclusion of these (and other) aspects would have given readers a better picture of what’s transpired and what is at stake. There is a motive that the article leaves implicit. Washington Square was a place for people to congregate and exercise free speech, a place to occupy and use. In the new plan, it’s a place to pass through and admire, where fixed installations crowd out the space that people once enjoyed. Gates and fences do not say welcome; they say keep off the grass, do not loiter, keep moving, this space no longer belongs to you. If there are two things the Bloomberg administration does not like, it is people who exercise their rights of free assembly and speech in public and people who might do so. The victims drag-netted by police tactics during the 2004 Republican Convention know this. Places like Washington Square Park, Union Square Park and the Sheep Meadow are dangerous for demagogues and autocrats. Parks Commissioner Adrian Benepe‘s contention that “most people will not remember what all the fuss was about” is a poor rationale for replacing a much-beloved Greenwich Village people’s park with a lower Fifth Avenue patrician’s promenade. After all, who in today’s younger generation remembers seeing and experiencing McKim, Mead & White’s glorious 34th Street Penn Station, which was torn down in 1963 and 1964 to make room for today’s ugly replacement? That destruction helped lead to the creation of the Landmarks Preservation Commission to prevent further desecrations. It is hoped that our experience with Washington Square Park will lead to further preventive measures. As I mentioned last week, The Times sent photographer Annie Tritt on my Walking Tour in September for photos to accompany the article; however, none of those photos were published. Instead, there were numerous photos of Washington Square Park throughout history – which made this public space seem very impressive – and it is, of course – and showcased its illustrious past. Nonetheless, at least one photo of the park under construction would have been appropriate. And while I think it’s the great that the Times story on “The Battle for Washington Square” appeared (the whole issue has been woefully under-reported), I did have some further critique and reflection on some omissions and characterizations in the story which you can read here. Correction: Actually, the Times did run two photos from the day of the Walking Tour of the Park but they are rather small and do not illustrate any of the construction. Before Mayor Bloomberg‘s well orchestrated push to overturn voted-in term limits (with the complicity of City Council Speaker Christine Quinn and 28 other members), the mainstream media applied a general lack of scrutiny to his actions. More recently, some light has been shone on the man behind the curtain. Until now, the Mayor had almost succeeded in pulling the wool over the eyes of our city. His initiatives include: taking over control of schools (with parents outraged over the non-stop testing) – and then cutting funding from them, privatizing our public parks, eliminating recycling(until activists got on his case, along with the NYC Comptroller), cut backs to libraries and senior centers, issuing non-stop Tax breaks to billionaire developers and corporations & misusing confiscations through eminent domain so that our city is basically owned by corporate interests, besieged by “luxury” housing. We’re on the precipice of WHAT OUR CITY IS GOING TO LOOK LIKE for the NEXT 30 YEARS. Drastic changes are being made with his finger on all the triggers. I could coexist with our billionaire Mayor if he’d keep on his side of the room. I’d stay on mine. Unfortunately, he owns the room. So what then? Mayor Bloomberg’s imprint is stamped all over what is happening at Washington Square Park. From the complicity of the City Council members (specifically Speaker Christine Quinn and Council Member Alan Gerson – it’s Gerson’s district), to the Landmarks Preservation Commission to the Arts Commission to the Community Board. However, despite the Mayor’s control and wishes, even the local Community Board voted against the Park’s “renovation,” albeit on the third try, once they recognized the arrogance and duplicity of the New York City Parks Department in ignoring their requests for information. 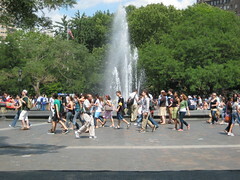 Yet, from NYU to the “Tisch Fountain,” Mayor Bloomberg’s privatization agenda looms large. Why…? Because Washington Square Park is the antithesis of Michael Bloomberg’s “vision” of New York City — a freewheeling cacophonous non-permitted jumble of free speech, free music, free performance, free political debate – and police cameras all over the place. Washington Square Park at one point housed more surveillance cameras per square foot than any other 9 acre area in NYC. 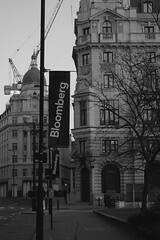 Bloomberg has made no proposal to remove or reduce the surveillance, only the public activities they are surveiling. Gawker recently covered what it’s really like to work at Bloomberg L.P., the corporation he founded, and how astonishing it is that the appalling conditions there have not merited more coverage (instead .. it’s as if he liberated City Hall by banishment of walls and dividers!). Read about this here: The Other Reason Mayor Mike Couldn’t Run. The Landmarks Preservation Commission held two days of public hearings on Washington Square Park. It was later ruled by NY Supreme Court Justice Emily Goodman that the City — specifically landscape architect and Parks Department employee George Vellonakis — during its presentation to the LPC had withheld key information. The incomplete and untruthful information is what LPC based its decision on. You can watch footage of the presentation by George Vellonakis at the hearing here. Mr. Tierney told the Times that he was afraid the budget would get cut the next year. However, wouldn’t it be better for the agency to be well staffed for that one year vs. worrying about something that might or might not happen? One wonders if Mayor Bloomberg wanted the LPC to have no teeth by appointing someone with no appropriate background to head it up, as development soars and the history of our city vanishes at an alarming rate. 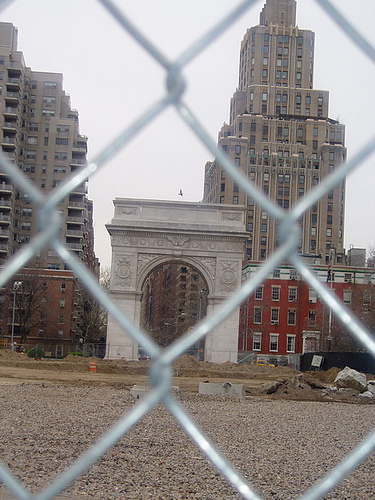 WSP Blog readers know that I’ve had some critique of the Washington Square Park Task Force, a body presently under the aegis of Community Board 2 which is also comprised of members of the public, the Community Board, and representatives of elected officials. The elected officials represented on the Task Force are: Congressman Jerold Nadler, City Council Speaker Christine Quinn, Manhattan Borough President Scott Stringer, Council Member Rosie Mendez, Council Member Alan Gerson, State Senator Tom Duane, and Assembly Member Deborah Glick. 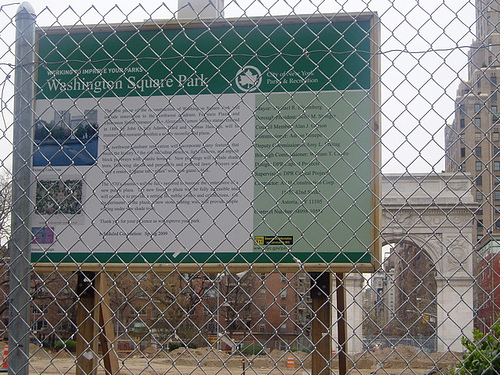 The WSP Task Force is supposed to be the body that follows up on the (admittedly tepid) Gerson-Quinn Agreement and the “stipulations” put forth in that letter dated October 6, 2005 from Gerson and Quinn to NYC Parks Commissioner Adrian Benepe which mildly attempts to monitor some aspects of the Washingon Square Park redesign allegedly in the interest of the community. The WSPTF meets infrequently. Understandably, to some degree, no one feels they have true license to monitor the NYC Parks Department since it is almost a rogue operation at this point. However, there are some great people on the Task Force who would like to push the envelope a bit and defend this dynamic, historic public space and this should only be encouraged. 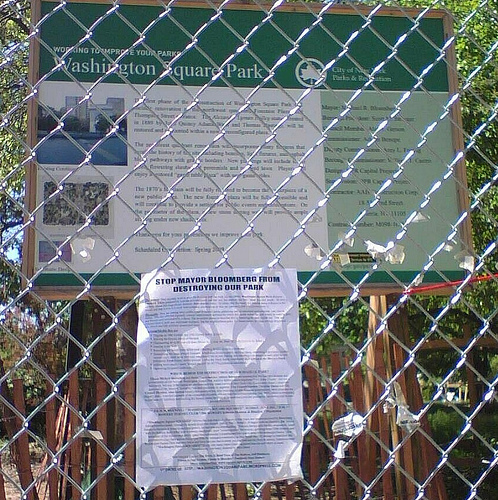 An example of the NYC Parks Department’s non-compliance with the “Gerson-Quinn Agreement:” the 4 foot fence currently being installed with “decorative spears” on top does not comply with the “Agreement” and yet this has apparently not been addressed by anyone, either on Speaker Quinn’s or Council Member Gerson’s staff or by anyone on the Washington Square Park Task Force. Nonetheless, the fact that they are meeting is a good thing. Wednesday, December 3rd, 6:30 p.m.
* To read the purported goals of the WSP Task Force, go here. This flyer counters the NYC Parks Department’s spin on what is actually happening behind the fencing to Washington Square Park at the hands of the Bloomberg Administration. It’s been pretty effective since people read it quite thoroughly. The question everyone asks is “Why?” The flyer attempts to answer the question while putting into context the politics and involvement of everyone from Mayor Bloomberg, Parks Commissioner Adrian Benepe, and NY City Council Speaker Christine Quinn to private interests like New York University and the Tisch Family in the unwelcome redesign of this dynamic public space. 7. Leave the Dog Runs as they are. Moving every piece of this park at this time does not make sense. Write in with any and all ideas, of course. Read an expanded version of the flyer’s information here. Last month’s 29-to-22 [NY City] council vote to do Bloomberg’s bidding was the most tawdry moment in city politics I’ve ever seen. More camera crews and reporters attended the vote than any other session in City Council history—some said the passage of the bill was as close as we would get to a mayoral election in 2009. The Bloomberg who came into office as the anti-politician, promising to transform city government, has been transformed himself. … But seven years later, Bloomberg has not only proved himself to be a master politician, as hungry for power as anyone we’ve ever seen, but he’s also ended up putting nearly everyone who deals with the city deep into his political debt.